Author Beverley Gray has also included dozens of healthy and delicious recipes, including Wild-Weed Spanakopita, Dandelion Wine, and Cranberry-Mint Muffins. "This is not a book. It is a prayer. It is a psalm. It is a window into the past. It is a glimpse of the future. It is awesome beauty. It is roots digging deep and flowers flying free. It is fact and fancy, medicine and myth. If you open it, you will have to buy it, for this is a feast you will want to eat slowly, to savor, to relish, to return to again and again. A great guide to green blessings in green ways written by a true wise woman." 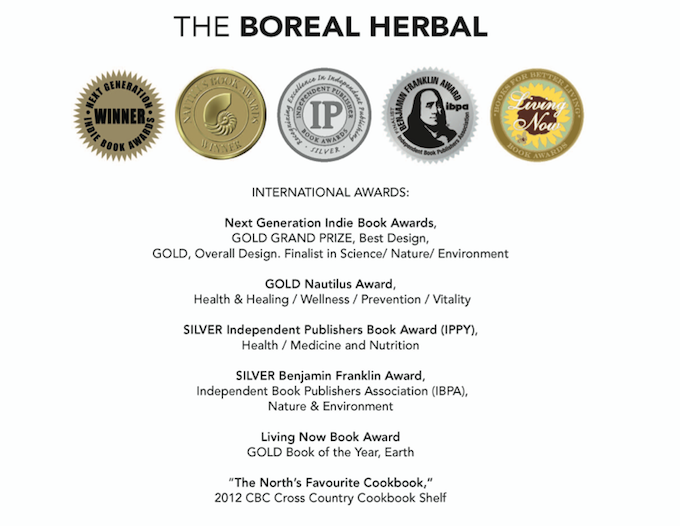 "The Boreal Herbal is an inspired distillation of herbalist Bev Gray's years of experience amongst the plants, berries and trees of the boreal forest. 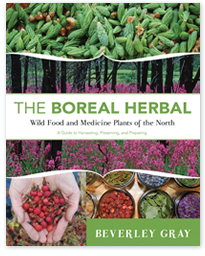 Generous, learned, passionate and packed with scientific and medicinal information, The Boreal Herbal is the essential reference book, field guide, how-to manual and cookbook for every Canadian interested in foraging for edible plants, making their own salves and ointments, or simply learning more about the flora of the boreal forest. Bev's love for plant life and her spiritual connection to her material shine on every page; she is the best possible companion on this journey into the wild." "...a treasure chest of information about the world's largest ecosystem. When you open it, you are dazzled by its beauty, which seems to be inspired by the northern lights. On closer examination you see jewels of information on edible and medicinal plants that is valuable to all... The Boreal Herbal goes way beyond a list of uses for herbal enthusiasts, to an art form that just might redefine herbals into the future." "...both a practical guidebook and wonderful celebration of the flora of our northern forests. Let it heal your wounds, fill your stomach and inspire in all of us an ever greater appreciation of the extraordinary place we call home." Beverley Gray is a boreal herbalist, aromatherapist, natural-health practitioner, journalist, and an award-winning natural health-product formulator. She owns the Aroma Borealis Herb Shop in Whitehorse, Yukon.